Don Van Natta Jr. (@DVNJr), Sr. 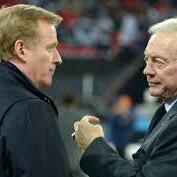 Writer for ESPN, joins Brian Berger to discuss the battle between NFL Commissioner and Dallas Cowboys owner Jerry Jones & how the battle could impact how the league & its owners operate moving forward & if Goodell will have his contact extended. Former USC & Washington Director of Football Operations Jared Blank (@InMotional) also joins the show to to talk about his upcoming quest to complete 7 marathons on 7 continents in 7 days.